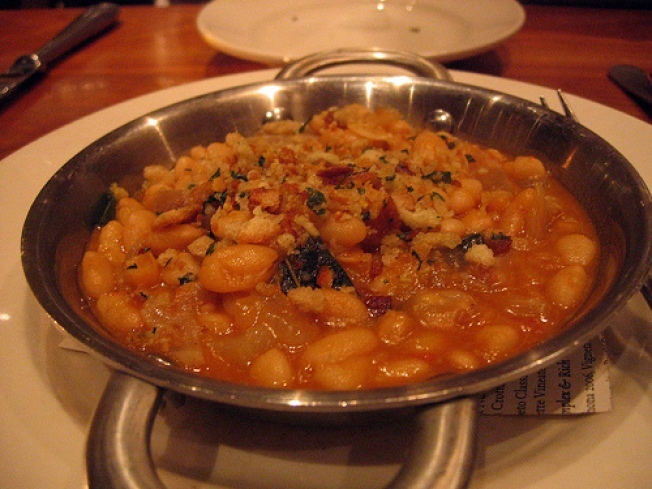 The nervetti with sage, cannellini beans and pangratto. Chris Cosentino is among my favorite chefs and I will try pretty much anything that he cooks. And while my favorite appetizer at Incanto, the offal-themed gem of an Italian restaurant in Noe Valley, remains the grilled beef heart and my favorite entree is still the bucatini with cured tuna heart, I was also excited to try what was on his menu when I last visited. To start, I had the nervetti with sage, cannellini beans and pangratto. What is nervetti, you ask? Simply put, it’s the chopped up tendons and meat from the foot of a calf. The most noticeable thing about it is its gelatinous texture, so aspic-like that the dish had a lip-smacking quality to it with every mouthful. Mixed with the cannellini beans, the nervetti’s texture wasn’t too overpowering, but it was certainly a different texture to get used to. For my entree, I had the pappardelle with duck sugo, tomato and cerignola olives. Pappardelle is one of my favorite pastas but I don’t see it on menus that often, so I knew I had to try this. Served tossed with a hearty and rustic sauce, it was really fitting given how cold it was outside when I ate at Incanto. The pieces of duck were tender and delicious. I ended my meal with Incanto’s apple butter doughnuts. These lacked the traditional doughnut texture that I was expecting, but they were still good. Light and fluffy on the outside, filled with apple on the inside, they were a welcome finish to my meal. Incanto’s menu is always changing, so I’m due to head back soon and see what they’re offering this season. Chef Consentino always has a few surprises on the menu and this visit was no exception.